The incident is a grim reminder of the dastardly terror attack at the Army base camp in Uri in Kashmir where 18 jawans were killed. “This heinous and despicable act has been perpetrated by Jaish-e-Mohammed, a Pakistan-based and supported terrorist organisation proscribed by the United Nations and other countries. This terror group is led by the international terrorist Masood Azhar, who has been given full freedom by Government of Pakistan to operate and expand his terror infrastructure in territories under the control of Pakistan and to carry out attacks in India and elsewhere with impunity. The Government of India is firmly and resolutely committed to take all necessary measures to safeguard national security. We are equally resolved to fight against the menace of terrorism. We demand that Pakistan stop supporting terrorists and terror groups operating from their territory and dismantle the infrastructure operated by terrorist outfits to launch attacks in other countries. We strongly reiterate our appeal to all members of the international community to support the proposal to list terrorists, including JeM Chief Masood Azhar, as a designated terrorist under the 1267 Sanctions Committee of the UN Security Council and to ban terrorist organisations operating from territories controlled by Pakistan. 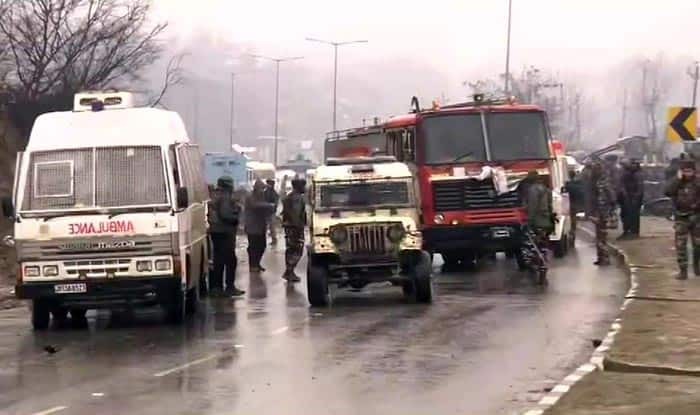 Pulwama Blast Latest Updates: According to Zee News sources, the death toll in the attack has risen to 44. Srinagar: At least 44 CRPF personnel were killed and several others injured in Jammu and Kashmir’s Pulwama district when a Jaish-e-Mohammed terrorist rammed an explosive-laden vehicle into the bus they were travelling in. The casualties are likely to go up. The blast took place when the bus was travelling through Srinagar-Jammu highway in Awantipora area. Jaish-e-Mohammed has claimed the responsibility for the terror attack, in a text message to Kashmiri News Agency GNS. As per reports, nearly 2,500 jawans were part of the CRPF contingent which was moving from Jammu to Srinagar. According to reports, the blast reportedly took place around 3:40 PM. According to news agency ANI, gunshots were reported from the area after the blast took place. The area has been cordoned off and a massive search operation is underway. “Terrible news coming from the valley. A number of CRPF soldiers are reported to have been killed & injured in an IED blast. I condemn this attack in the strongest possible terms. My prayers for the injured & condolences to the families of the bereaved,” Former Jammu and Kashmir CM Omar Abdullah said. Mehbooba Mufti took to Twitter to condemn the incident. “Disturbing news coming in from #awantipura . Twelve of our security personnel have been martyred and several have been injured. No words are enough to condemn the gruesome terror attack. How many more lives will be snuffed out before this madness ends?,” she said. This attack is being said to be the worst attack on security personnel after the infamous Uri attack which took place in September 2016. Heavily armed militants suspected to be from Pakistan-based JeM stormed an army base in Uri in Kashmir killing 18 jawans. Nearly 10 days after militants attacked the Army base camp in Uri that left 18 jawans dead on September 18, 2016, India carried out surgical strikes in PoK, killing around 40 terrorists and seven terror launch pads.